Yesterday I received my long awaited new watch. This is a i’m Watch color watch. The i’m SPA company claims that this watch is the first real smartwatch in the world. 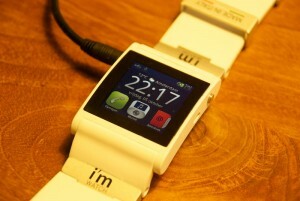 This watch uses a slimmed down and highly customized version of Google’s Android, called i’m Droid. First thing I did was upgrading the watch to the most recent firmware version which is 0.5.0. As soon as the new firmware was active I tried to connect the watch to my phone, which is a webOS HP Pre3. The watch communicates using Bluetooth, and it turns out it’s not a problem to pair and sync. I have to admit that I’m using the default installed Mobile Hotspot app which comes with webOS 2.2.4 for the Pre3 but with a minor, but important addition. I had to add a small script to the /etc/event.d directory to allow IP forwarding and added three iptables rules allowing NAT traffic to pass through. You can find this script at the end of this post. I’m pretty pleased with the watch, but there is one major drawback compared with my old school watch and that’s battery life. I know the comparison is not fair, but when I use the watch regularly it lasts two days, while my conventional watch needs a new battery every four years. Another thing is the voice quality when using it to answer or make calls, but perhaps that’s an issue with the phone. I’ll write another review when I know the watch better.